AutoSpeed - Holden Commodore VL SS Group A "Walkinshaw"
Holden Commodore VL SS Group A "Walkinshaw"
It all began in the 60s and 70s when a man called Peter Brock drove Holden-manufactured vehicles to countless Touring Car victories around Australia. As a result of his on-going success, a partnership between the Brock and Holden was created in the early '80s. 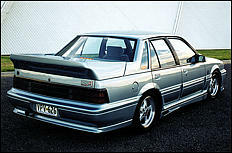 This saw early-model modified Commodores released wearing the Peter Brock signature of approval. These were the Brock HDT cars. However, this marriage shattered on February 9, 1987 after a complicated and on-going feud between the two. Holden had not wanted to take part in some of PB's business practices - and especially didn't want to be associated with Brock's controversial 'Polariser'. Holden publicly stated "it could see no technical merit in the device" and privately warned Brock not to fit it. Confident in the product he was promoting, Mr Brock said the Polariser used 'orgone energy' in its operation to give the car many performance advantages. A new VL Director model created by Brock without much discussion with Holden further influenced company's decision to call it quits. But Brock and the HDT road cars had shown Holden the image importance of marketing modified versions of their family cars. Soon after the break-up, Holden replaced the Brock HDT vehicles with their own generation of Holden Special Vehicles. 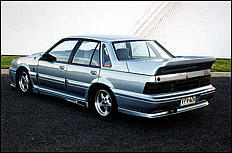 A partnership between Holden and British-based Tom Walkinshaw, the formation of HSV radically changed the direction of Australian modified cars. With a substantial budget and resources, HSV had what it needed to convince die-hard Brock Commodore fans that they were more than capable of filling the old shoes. But HSV knew that their first car was going to have to be a killer - a car to emphatically state the differences between what were basically a low-budget tinkering jobs and what could be developed by a huge manufacturing conglomerate. 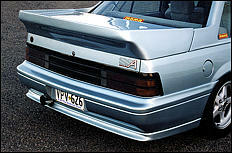 Their first project was the VL Commodore-based Group A SS "Walkinshaw". Only 500 were built (down from an anticipated 750), with production commencing in December 1987. Even so, the last ones struggled to be sold and some were raffled-off. But the essence of a great car was plainly obvious. The new big budget allowed HSV and Holden to both totally re-engineer the Holden V8 and also develop one of the most effective but outrageous aero packages ever fitted to a production car. In addition to being a road car for HSV, the car served the dual purpose of a homologation vehicle for Group A racing - and the Walkinshaw Commodore was designed as a racecar first and foremost! In anticipation of extensive motorsport use, the pushrod V8 used bullet-proof 4 bolt main bearing caps. The closely-related Chev small-blocks were looked towards as an engineering guide for this development. The entire engine block was also significantly stiffened, being reinforced laterally from the deck through to the mains and throughout the main bearing areas. The nodular crankshaft that was fitted was an item carried over from the previous year's homologation race engine (the old Formula 5000 casting). Interestingly, the conrods were also designed specifically for use in the PFI engine. Using similar pistons to the earlier VL SS Group A, a compression ratio slightly higher than 8.5:1 was used. Swept volume remained the same as the previous 'Permanent Red' Brock car at 4937cc. Cylinder firing order and valve sequence were also changed, as a line of blown head gaskets were plaguing previous engines. For cost saving reasons more than anything else, the Walkinshaw retained the heavy cast-iron cylinder heads, but these were reinforced for extra stiffness and re-engineered for a huge increase in gas flow. 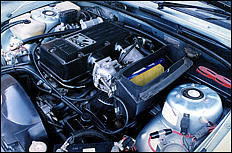 The engine also carried on the 1986-introduced roller rockers, big Chev-type harmonic balancer, thick-walled pushrods and a lightened flywheel. A major design upgrade came with the fitment of a highly sorted engine management system. The MAP-sensed system controlled both fuel and spark, using a 16k program GM-Delco engine management system matched with Bosch sensors. The air intake system used a very large single plenum chamber containing individual tuned-length bell-mouthed ram-tubes for each cylinder. Air entered into this volume after passing through twin staged throttle bodies which were configured so that the second butterfly was closed during 90% of urban driving conditions. This arrangement was fitted mainly to allow the race car engines to breathe HUGELY! A total power output of 180kW (241hp) net was made, along with 380Nm of torque at 4,000rpm. While punters at the time made negative comparisons with the power outputs of the Brock cars, the HSV testing was a lot more rigorous in determining power than Brock was reputed to have been! The driveline was beefed-up using a 'BT5G' Borg-Warner 5-speed gearbox, a heavy-duty clutch and a 3.08:1 ratio LSD with shot-peened gears. Straight-line performance was where the Walky shone. Weighing in at a fairly porky 1415kg, the car was still much quicker than its contemporary stable-mates thanks to the more progressive torque curve, higher peak power figure AND soap-slippery panels. The zero to 100km/h sprint was cut in 6.9-7.0 seconds and the quarter mile took 14.8 seconds. Holden themselves predicted the cars at 6.5 and mid-14 seconds respectively. Contemporary HSV advertising proudly splashed quotes of "the six second club" in reference to its 0-100 time. But it's the incredible appearance of the car that leaves the greatest impression on most of us! A lot questioned the merit of having such a physically huge aero package but the justification was simple - it worked. Walkinshaw-Holden Motorsport's chief engineer, John Lindell, helped develop the kit through extensive wind tunnel testing in Britain. It was the first real aerodynamic development ever undertaken by Holden for a production car. The goal was to minimise drag while also maximising downforce; a combination that is difficult to achieve. To assess their results, compare a Permanent Red VL Group A with a Cd of 0.41 against the Walky's 0.32 Cd - a drop in drag of 22 per cent! Holden's figures indicated that an aero-kitted Walky travelling at a sustained 190km/h required 30kW less driving power than the previous Red Group A! While the car was obviously slipperier through the air, downforce (or more likely, a lack of lift) could be distinctly felt at speeds over 80km/h. 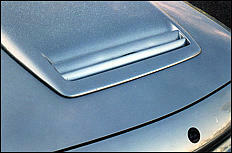 But even with the great aerodynamic efficiency, the car could still slurp through a considerable amount of fuel. Drivers could expect no better than 16.9mpg (18 litres/100km) in hard driving in urban conditions - phew, lucky it had an 84 litre fuel tank! Holden designed its own wheels to suit the car instead of opting for the Momos used on the Brock Permanent Red model. These pretty things measure 16x7 inches and came shod with 205/55 series rubber. Quality Bilstein dampers were also added to the existing FE2 suspension package that incorporated new springs, bars and bushes. Handling was praised as being razor-sharp given the car's humble origins, but it could be a bit of a juggle for an inexperienced driver. It certainly wasn't a foolproof handler. Contemporary road testers commented "the car had a tendency to lean on the outer rear wheel when cornering" (ie inducing oversteer). This wasn't a problem in dry weather conditions, but none of the tests were conducted with water running across the road - we've been told you have to be ultra-careful driving these beasts when the heavens have opened! The same live-axle system as fitted to other Commodores suspends the car, which hereditarily suffers from axle-hop and bump-steer from the rear. 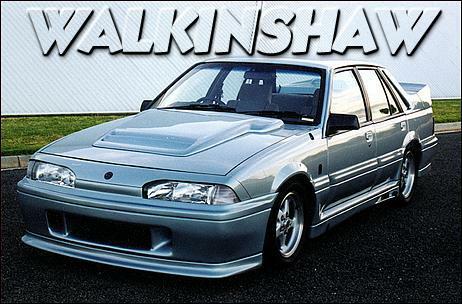 But the Walkinshaw was Holden's first performance package. It was more than just a car equipped with heavy-duty springs, a tickled engine and wide tyres. 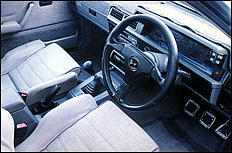 Its interior even featured very well bolstered seats, a sporty steering wheel and comprehensive instrumentation. And it did come together as a true race car - winning the famous Bathurst race, ironically well after sales of the new cars had finished.